Foreign insurers bet big on their Indian ventures - Corporate Risks India Insurance Brokers Pvt. Ltd.
Once foreign insurance companies’ fears over management control were allayed, they spent large sums of money to up their stakes. In February 2015, when the Insurance Laws (Amendment) Act was passed, the cap on foreign ownership of Indian insurers was raised from 26 per cent to 49 per cent. This, it was widely believed, would open the sluice gates for foreign investment in the capital-starved sector. However, a new term in the rule book, “Indian management control”, began to haunt the industry. With no clarity on what this meant, the industry was understandably apprehensive. The FDI limit change was meant to be a game changer. But doubts persisted over control and Indian management. Some interpreted it as no foreigner being allowed to be a part of an insurer’s top management, while others saw it curtailing their voting rights. Several estimates of FDI inflows, ranging from Rs 20,000 crore to Rs 30,000 crore, were aired, yet analysts were reluctant to provide timelines, because they felt that Indian management control could be a dampener – with a higher stake, the foreigners were bound to ask for more say in the management. Ten months later, the fears have proved baseless. At least 12 insurance companies have sent their applications to the Foreign Investment Promotion Board (FIPB) to increase the stake held by their foreign partners. Bharti Enterprises became one of the first to state that its overseas investor, AXA, would step up its equity investment in the life and general insurance companies to 49 per cent. Shortly afterwards, it applied to FIPB. In December, AXA increased its stake in Bharti AXA Life Insurance and Bharti AXA General Insurance to 49 per cent after receiving approvals from FIPB and the Insurance Regulatory and Development Authority of India (IRDAI). FIPB had approved AXA’s proposal to invest Rs 1,290 crore in Bharti AXA Life and General Insurance. The future, say experts, looks promising. Amitabh Chaudhry, MD & CEO of HDFC Life, says clarity from the regulator on Indian management control has helped insurance companies, and now more of them are going to FIPB for approval of a higher foreign stake. He says a couple of billion dollars will come in as FDI in the next 12 months. 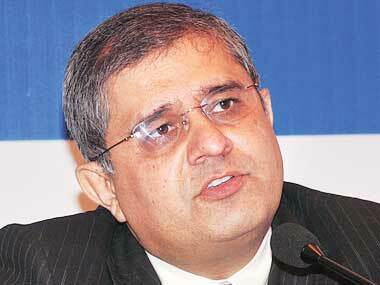 “Companies will have to comply with Indian management control first before getting into valuation discussions. They are involved in that,” he adds. In October, IRDAI defined Indian management control, which includes the right to appoint a majority of the directors and authority over management decisions, including by virtue of shareholding, management rights, shareholders agreement or voting agreements. It also said control over significant policies of the insurance company should be exercised by its board. Quorum shall mean and include presence of the majority of the Indian directors, irrespective of whether a foreign investor’s nominee was present or not. Insurers have been given three months to comply with the guidelines, but IRDAI will grant them another three months to meet the requirements. However, in anticipation of the policy changes, the valuation process in the insurance sector was set off much before the new policy was announced. 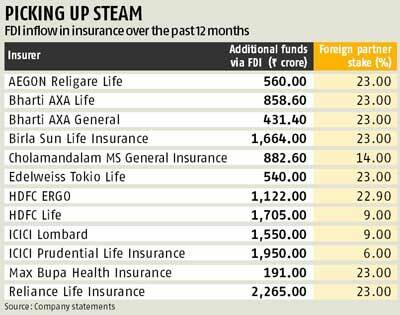 In December 2014, Housing Development Finance Corporation had said the Azim Premji Trust would buy a 0.95 per cent stake in its life insurance venture, HDFC Life, for Rs 198.9 crore. The deal valued HDFC Life at Rs 19,890 crore. In August, Standard Life announced it would buy a 9 per cent additional stake in its Indian insurance venture, taking its stake to 35 per cent. The foreign insurer was to pay Rs 1,705 crore for the 9 per cent stake, valuing HDFC Life at Rs 1,8951.4 crore. In October, ICICI Bank said it would sell a 9 per cent stake in ICICI Lombard General Insurance to Fairfax Financial for Rs 1,550 crore. The deal valued the company at Rs 17,225 crore, making it the most valued private general insurer. Valuations previously unheard of came into play. In November, ICICI Bank announced it would sell a 6 per cent stake in ICICI Prudential Life Insurance to Premji Invest and its affiliates, and Compassvale Investments Pte, a unit of the Singapore-based Temasek, for Rs 1,950 crore. The deal values the life insurance company at Rs 32,500 crore, making it the highest valued private insurance company. At a time when insurance penetration is low, IRDAI is of the view that FDI will enable more funds into the sector, thereby improving penetration. The additional funds brought in by foreign joint venture partners will be used by insurers not only to expand presence across the country, but also for digital initiatives to make the process of buying and selling insurance more efficient and easier. This would include creating new distribution channels and enabling tablet-based sales to allow insurance agents to access all information they need about products or the client on the go. In addition, in places where internet connectivity is an issue, insurers are also looking at setting up branches and offices adjacent to their bank partners. The idea is to not only increase the number of sales points but also be closer to the policy holder so that better after-sale service can be provided. At present, private sector insurers are lagging large public sector insurers when it comes to their presence in rural and semi-urban areas. 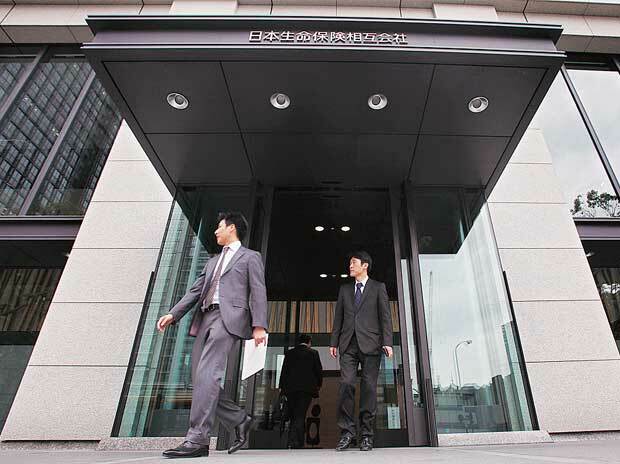 While foreign insurers are a little disappointed over rules that restrict their rights, given the potential for business, newer players are also expected to enter the country.